Wrap your skin in continuous moisture after a day in the sun. 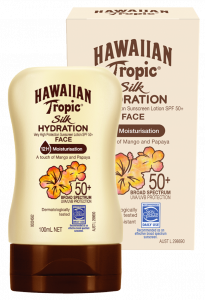 NEW Hawaiian Tropic® Silk Hydration After Sun Lotion delivers 12 hours moisturisation to soothe and soften your skin. The After Sun Lotion contains a touch of mango and papaya with an island mango fragrance. Aqua, Diisopropyl Adipate, Glycerin, Polyglyceryl-3 Methylglucose Distearate, Dimethicone, Mica, Cetyl Alcohol, Phenoxyethanol, Glyceryl Stearate, PEG-100 Stearate, Parfum, Acrylates/C10-30 Alkyl Acrylate Crosspolymer, Methylparaben, Polymethylsilsesquioxane, Propylparaben, Sodium Hydroxide, Butyrospermum Parkii Butter, Disodium EDTA, Sodium Ascorbyl Phosphate, Tocopheryl Acetate, Paraffinum Liquidum, Panthenol, Carica Papaya Fruit Extract, Mangifera Indica Fruit Extract, Passiflora Incarnata Fruit Extract, Plumeria Acutifolia Flower Extract, Psidium Guajava Fruit Extract, Aloe Barbadensis Leaf Extract, Limonene, Linalool, Hexyl Cinnamal, Butylphenyl Methylpropional, Coumarin, Hydroxyisohexyl 3-Cyclohexene Carboxaldehyde, Alpha-Isomethyl Ionone, Benzyl Alcohol, CI 77891.